12:30 p.m. & 3:30 p.m. Storm King Varsity Basketball Tournament - Please stay to support our team! Does Your Class Year End in a 4 or 9? Then get ready for Reunion 2019! It is never too early to gather classmates and friends and plan to return to the Mountain for your reunion. This year SKS Classes ending in 4s and 9s will be celebrating milestone reunions with the Great Classes of 1969 and 1994 celebrating their 50th and 25th respectively. 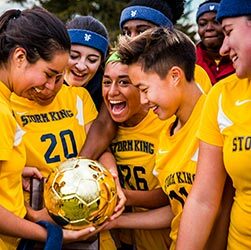 The Storm King School’s Reunion Weekend 2019 will be held from June 7th – 9th, 2019. Over the next several months, watch your mail and email for more details on registration, attendance, and the scheduling of events. In the meantime, rally your classmates and friends around Reunion 2019. For more information about Reunion 2019, please contact Sarah Fulton at sfulton@sks.org. If you have not returned to Storm King in a while, plan on experiencing the Mountain again for the first time!